Through numerous foodie adventures over the past year and change, I’ve fallen in love with many new foods. My mouth waters at the thought of salty garlicky bun cha in Hanoi and spicy succulent khao kha moo in Thailand and soft pungent French cheeses. And of course, who can forget my ultimate profession of love to the pierogis of Poland? But even with all the newly discovered favorites, when it comes to comfort food, there is still nothing, nothing, that warms my soul as much as my favorite childhood dishes. I grew up on a hearty diet of home cooked traditional Chinese foods, first lovingly made by my grandma in Beijing and then by my mom in the States. 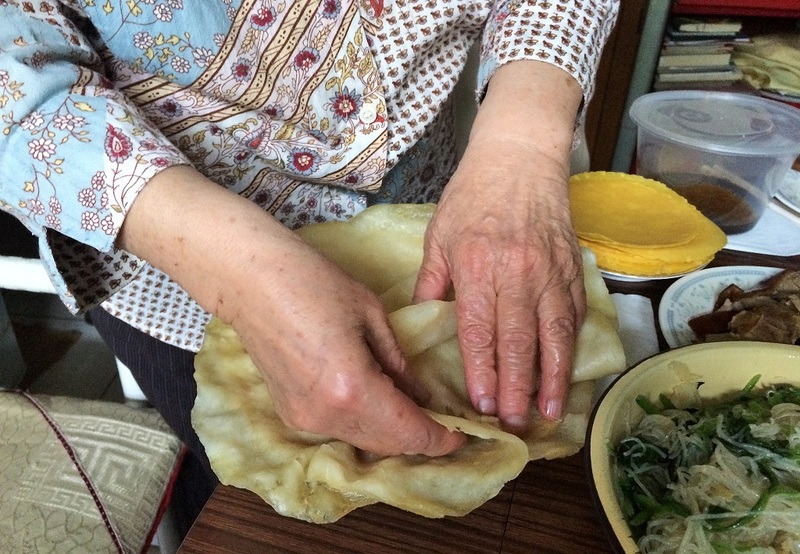 Half a world removed from our family and culture, it was especially important to my mom to preserve the Chinese recipes she grew up on and raise her family on traditional values and food. 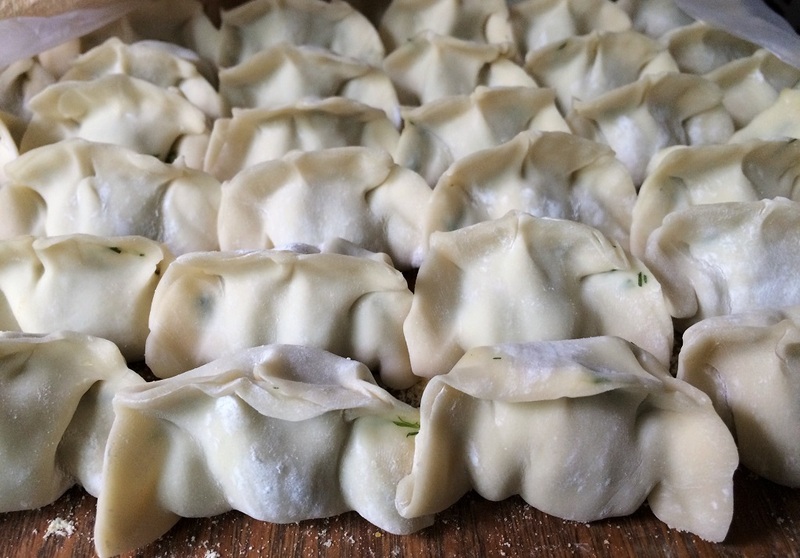 I remember that on weekend days, we’d make dumplings from scratch. 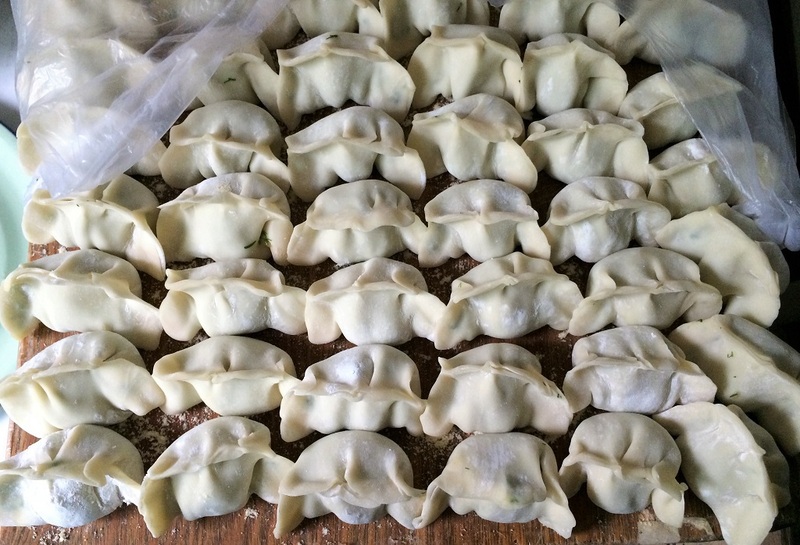 We’d mix the filling, cut the dough into little balls, roll into rounds, and finally carefully wrap into dumplings. My mom taught me how to dampen and fold the edges in such a way that they won’t come apart during cooking. Each batch was a serious labor of love. 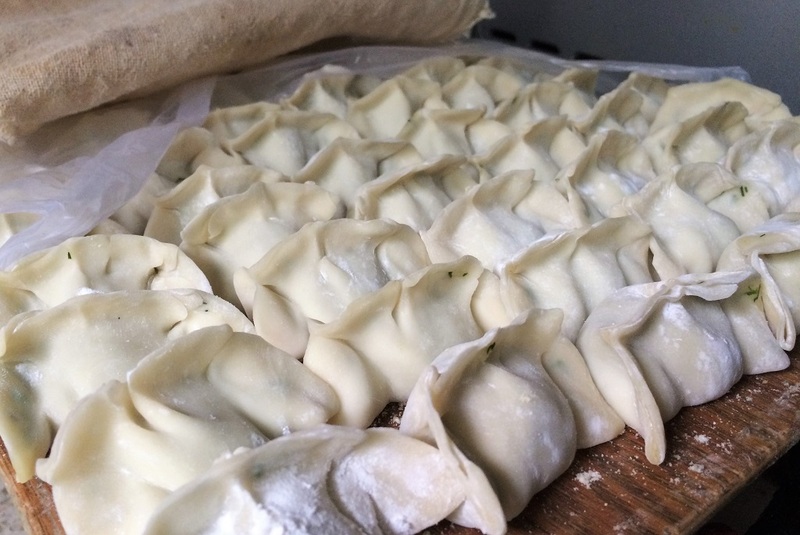 But of course, as time went on and our personal schedules got fuller, hand rolled dough got replaced by store bought wrappers and then got replaced altogether by store bought frozen dumplings. And of course, being across the globe, it was impossible to completely replicate the recipes for the more specialty dishes. But in order to bring a bit of Beijing into our American home, we learned to make do with tinned sauces and frozen wrappers. Who knew that I would actually take him to Beijing one day. That I would bring him to my grandma’s house, sit him down at the table, and say “this is my favorite dish. This is what I grew up on.” That I would giddily watch him take the first bite and witness his look of absolute delight as his taste buds made contact. Today, I want to bring all of you with me too. I want to give you a (unfortunately, virtual only) taste of my favorite childhood dishes. So without further ado, come with me as I revisit my grandma’s kitchen! This is a traditional Beijing noodle (it’s like the bolognese of Beijing) and it’s my absolute favorite dish in the world! The black sauce is made of slightly sweet fermented soybean and is cooked with onion, garlic, and ground pork. The sauce on its own packs a punch and is rather salty, so don’t forget the most important part: the veggie mix-ins. The most popular ones are bean sprouts, cucumber slices, and shredded cabbage. These balance out the taste a bit and also add extra texture to the noodles. 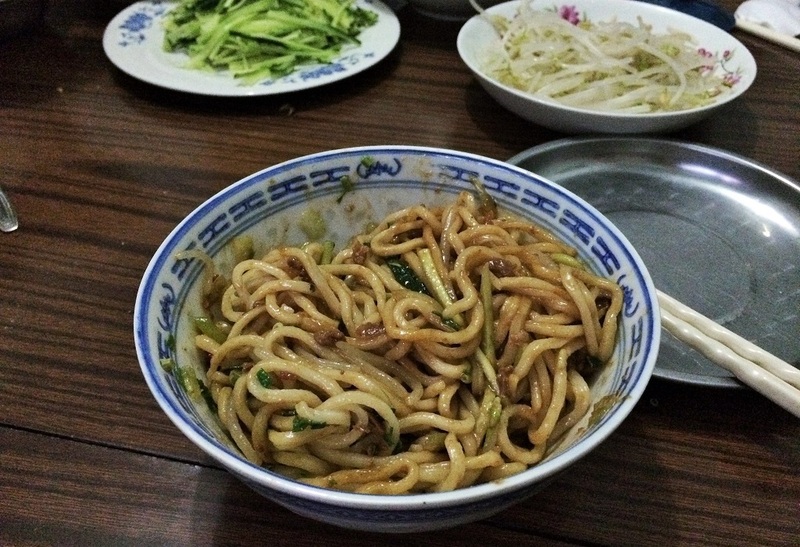 And here’s an insider extra: if you’re a true Beijinger, you’d chow down the noodles in between bites of raw garlic. You’ll find that Beijingers love to accompany dough-type foods with raw garlic, whether it’s whole cloves or minced into a dipping sauce. This is the one dish that I have never ever found a good replicate of in the States. I could not tell you how happy I was to finally eat my grandma”s version again. You can think of this as a Chinese burrito! A good wrapper should be very soft and thin, but still a little chewy. My grandma makes the best ones! It’s really an art to get them that thin. This meal is prepared with a huge spread of dishes. What’s served is usually up to personal taste and preference, but typically, there will always be a few staples: scrambled eggs with leek, stir fried tofu strips, vermicelli, and bean sprouts. For meat, we had roasted duck, chicken, and a couple different types of ham. 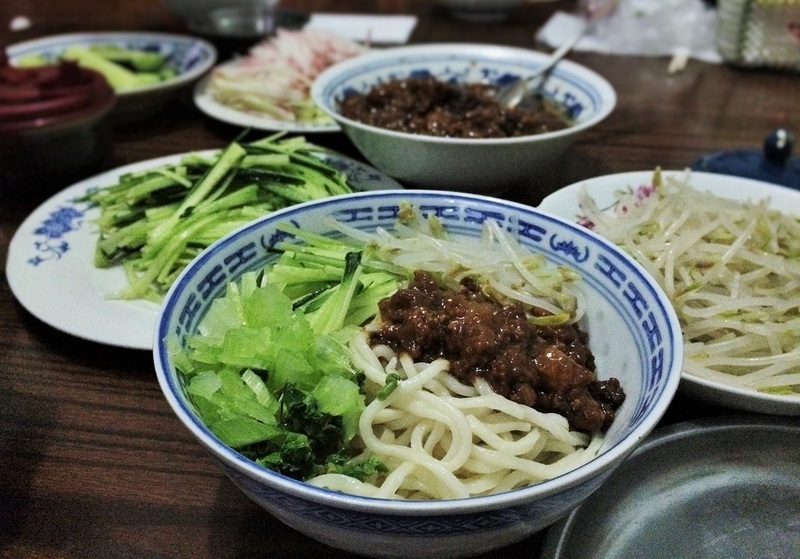 The traditional spread is tianmianjiang, simliar to the same sweet black bean sauce used in the noodles above. Raw strips of spring onion provide a crunch and spice note. Delicious! I’m not sure if there’s a better translation for this, because this is certainly not the fluffy buttermilk pancakes or the thin crepe-y pancakes you’re used to. 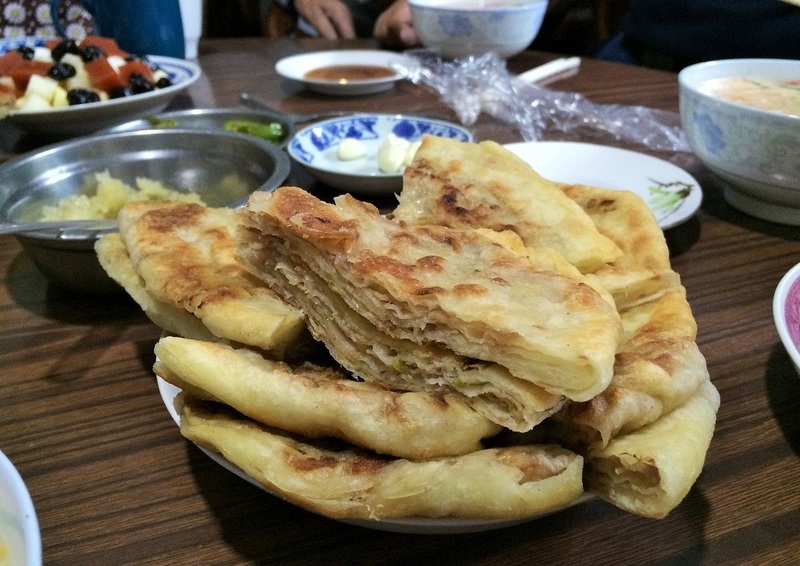 Chinese pancakes are made of rolled dough and pan fried in oil until just slightly crisped on the surface. Green onion pancakes are a popular breakfast choice and are one of my favorites, but I can never pass up its heartier cousin, the meat pancakes! 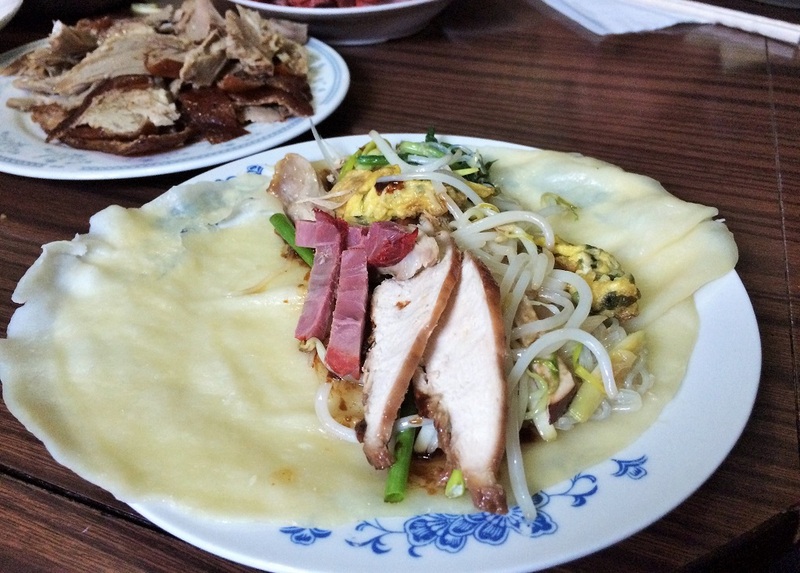 These meat pancakes actually take some skill to make as minced pork is sandwiched in between multiple layers of dough. It’s important to roll out each layer paper thin so the entire pancake is still soft and not too doughy. If you look closely and try to count the layers, there are an impressive 8 of them here! This is one of my grandma’s specialty dishes! Again, as true Beijingers, we eat these pancakes dipped in black vinegar with raw minced garlic (and whole cloves on the side if you need more). Sensing a theme here? You didn’t think I would leave dumplings off this list, did you? Zhajiangmian may be my favorite dish in the world, but dumplings are the one thing I could probably eat every single day for the rest of my life. 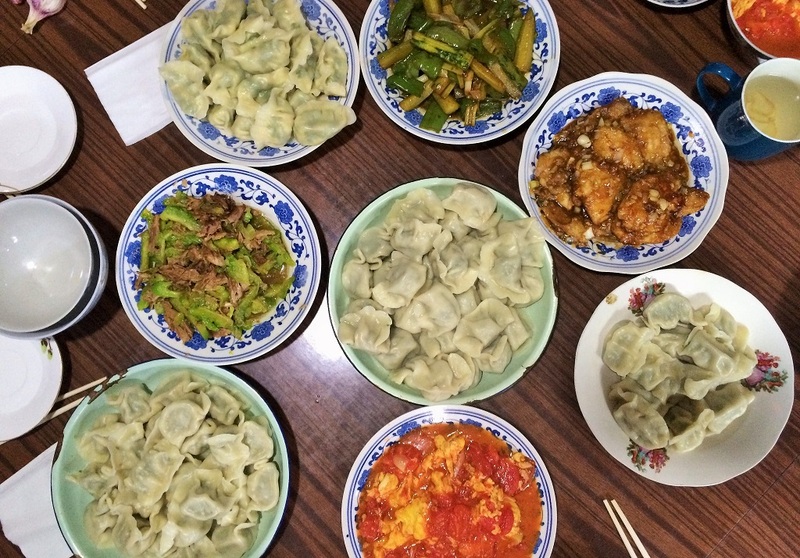 Traditionally, a family sends someone off on a journey with dumplings, so at the very end of our stay in Beijing, my grandma hosted our send-off meal with a large dumpling feast. As per my request, she made dill and pork dumplings, my favorite filling combination ever. I don’t think dumplings need any more elaboration! 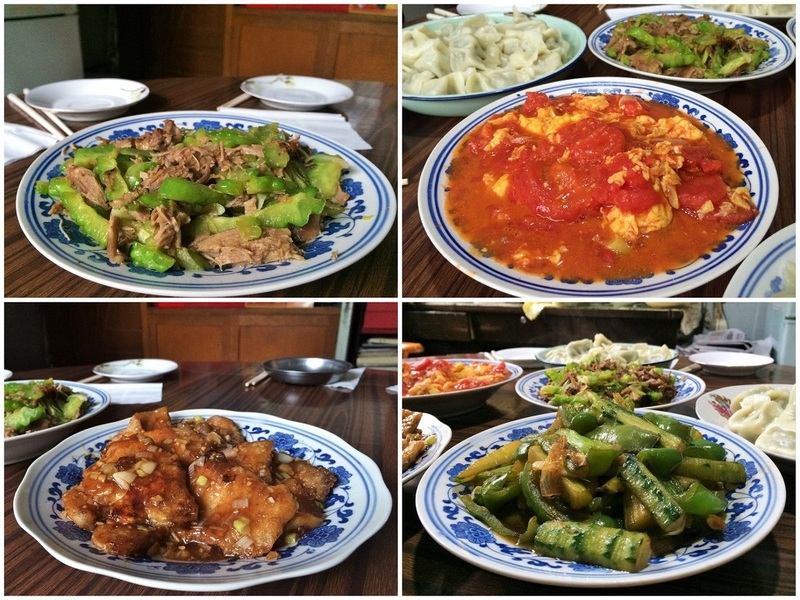 To accompany the dumplings, she made a few traditional Chinese home dishes: bittermelon with duck, tomato with egg, ginger battered fish, and sour cucumbers. The idea was that each dish would hit one flavor note: bitter, sweet, spicy, and sour. 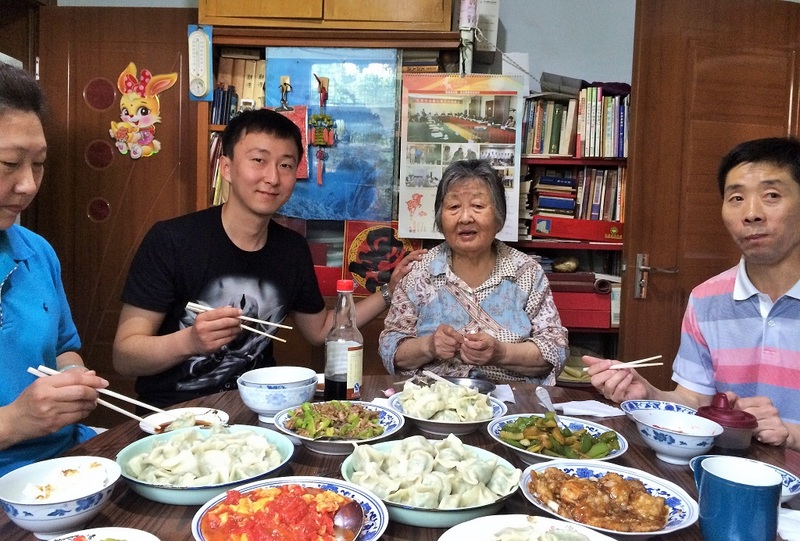 It was the perfect way to end our time in Beijing, a home cooked meal of all my favorite dishes. Eating at Grandma’s is like dining at the world’s coziest restaurant. I was so happy to be able to bring D there and have him eat the exact same dishes I grew up eating. There is perhaps no better intimacy than to show someone a slice of your childhood, and to share it with D, it truly made this trip special beyond words. I hope you enjoyed this little peak into the dishes of my childhood. And now, tell me, what are you favorite childhood dishes? This post is linked up to my friend Upasna’s blog-along. This month’s theme: Comfort Foods! If you’d like to join in on the blog-along, the theme is announced on the first Sunday of each month! Love this post. Not only am I starving, but I’m super nostalgic for your childhood! Aww thanks Polly! Putting it together made me so nostalgic too and made me wish that I had some of those dumplings right now! Thanks so much for stopping by Lynn! The Chinese pancakes are probably my favorite kind of “pancakes”. 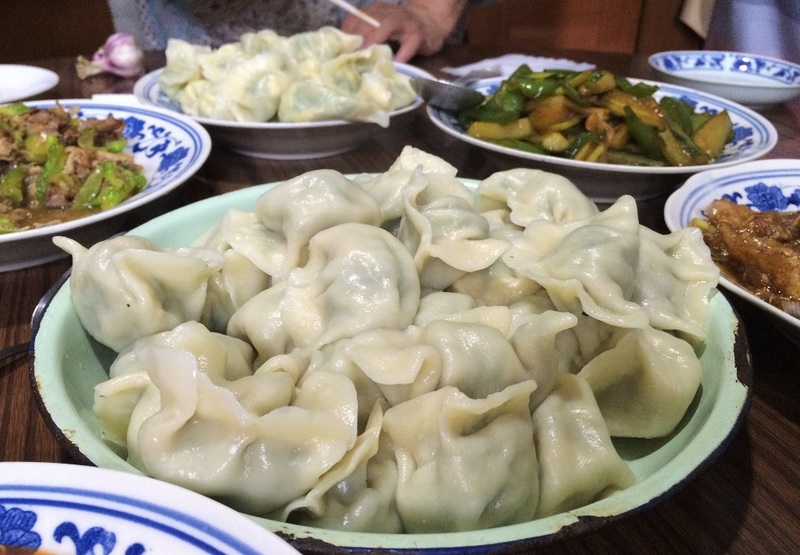 And yes, I miss my grandma’s dumplings!! I wish I could bring you too to try some! We are lucky that in the States there’s a large Chinese population so we can get most of the stuff there. The only thing is that I just cannot find the noodles in the States like how my grandma makes it!! I know how to make some of the more simple dishes, but not like my mom. I should learn too! Wow!!!!! I love this so much Anna! 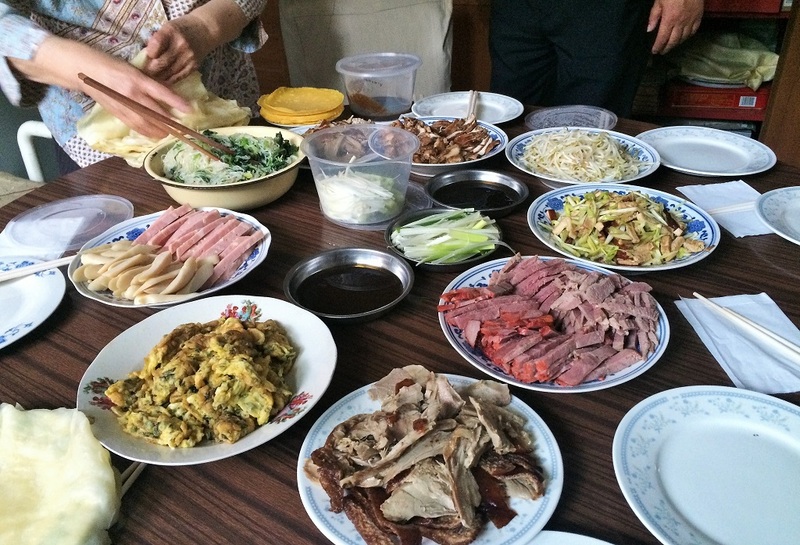 My grandma made the absolute best Taiwanese food, but alas, it was back when I was too little to help! And on a foodie note: I heart spring rolls. Always have. Always will. I completely agree… most of my memories are of the food and meal experiences I’ve had, ha! Chinese spring rolls are really good. They’re one of my favorite meals too! It was so special to finally share it with him, and he agreed with me that the noodles are the best he’s ever had! Grandma’s really make the best food! Exactly! :) Sigh, if only I can have some of those noodles and dumplings right now! Annaaaaaa!! Your post is making my mouth water!! I want to eat everything on your list. Please tell your grandmother that she will soon have a very hungry Indian to feed soon. Again, thank you so much for participating in the #BlogAlong. We would love to have you back next month. Thanks so much for reading Pooja, and so happy to discover your blog too! Noodles are my favorite too, along with dumplings! I can eat them every single day too, if only I wouldn’t get fat, lol. what a wonderful tribute to your grandma, and how blessed you are to have a grandma who can care for you and express love to you via food. =) i never had the privilege of meeting any of my grandparents since most of my family died in cambodia during the war, so i really enjoy reading posts like these because it gives me insight to what it may have been like, had i known them. It was! I was so glad to be able to take D to my grandma’s and have him eat the food I grew up on! I’ll take any excuse I can to eat more raw garlic. Those noodles though – “favorite dish in the world” is a bold statement, and after all you’ve eaten I trust your opinion. I bet this is such a fun meal! These kind of spring rolls are the best!! I don’t think we ever had the small deep fried spring rolls in my family. It was always these kind of fresh wraps. Yay another raw garlic lover!! If you ever go to Beijing, you have to try zhajiangmian. You can find it at most dumpling + noodle houses (though I still think my grandma’s is the best). I miss it so much right now! Beautiful post, Anna! And what delicious looking food :) Oh my! I love how taste brings back so many memories and associations. Thanks for sharing your grandma’s delights with us! I’m glad you enjoyed it Marcella! All these bring back so many memories of the time I spent in Beijing. I wish I could carry all these dishes with me everywhere! Beautifully written as always, Anna :) I love how we can have such a strong emotional connection to food, because what we were brought up on will always be a part of who we are. And all of these dishes are making my mouth water! I wish I could try everything! Thanks so much Courtney! I think our childhood dishes will always be the most special to us. 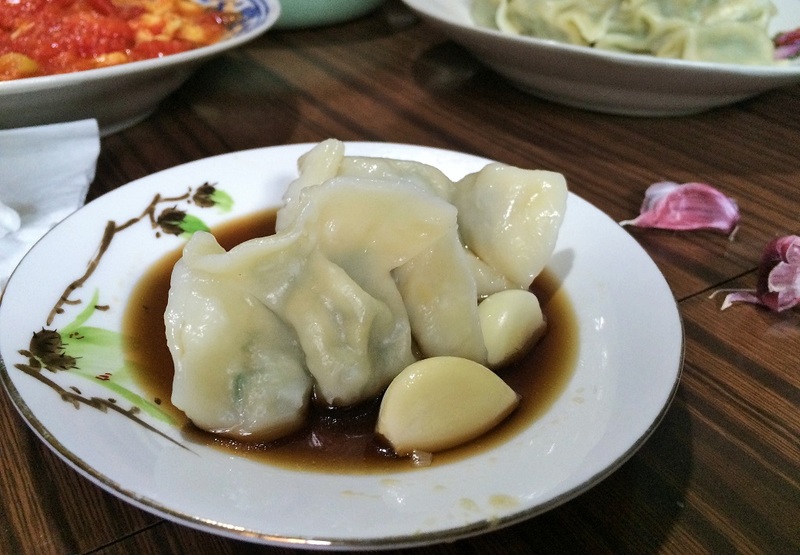 I wish you could try these traditional household Chinese dishes too!